Definition at line 42 of file IntervalPartition.h. Definition at line 53 of file IntervalPartition.h. References F(), llvm::PassRegistry::getPassRegistry(), I, llvm::initializeIntervalPartitionPass(), llvm::RISCVFenceField::O, print(), and runOnFunction(). Definition at line 93 of file IntervalPartition.cpp. References assert(), E, getRootInterval(), I, llvm::intervals_begin(), and llvm::intervals_end(). Definition at line 85 of file IntervalPartition.h. Definition at line 79 of file IntervalPartition.h. 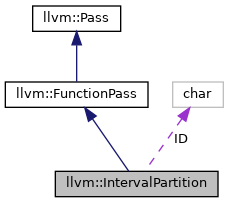 Definition at line 90 of file IntervalPartition.h. 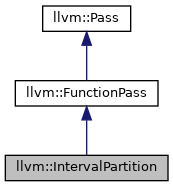 Definition at line 70 of file IntervalPartition.h. Referenced by llvm::IntervalIterator< NodeTy, OrigContainer_t, GT, IGT >::IntervalIterator(), and IntervalPartition(). Definition at line 74 of file IntervalPartition.h. Definition at line 41 of file IntervalPartition.cpp. runOnFunction - Virtual method overriden by subclasses to do the per-function processing of the pass. Definition at line 70 of file IntervalPartition.cpp. References assert(), E, I, llvm::intervals_begin(), and llvm::intervals_end(). Definition at line 51 of file IntervalPartition.h.